The Lord never allows us to experience a temptation or crisis that is so great it would take away our freedom. If we truly choose to fight, there is never a battle big enough to destroy us. Such is the mercy and care of the Lord. But sometimes this comforting teaching can be misunderstood. We can take it to mean we are to fight every battle solely by ourselves. We might mistakenly think we’re failing the Lord if we ask for help from others. Such thinking leads us to see temptations as a kind of test we are put through by the Lord. If we fail the test, or if we weaken to the point of having to ask for help, maybe we have let the Lord down? It is true that the Lord never allows us to face a battle that would take away our spiritual freedom. However, He allows us, even commands us, to ask for help in those battles. We do not have to fight alone. In fact, we cannot fight alone. We choose to do battle against the hells and, like Moses, we stand on the mountaintop holding our hands up toward the ideals we believe in. We say during the battle, "I will not break the commandments of God. I will not go against the things I believe in." But sometimes we tire. Like Moses’ weary hands, our faith seems to sink. We find ourselves giving in to temptation out of exhaustion. When we tire, the Lord gives us one simple command: ask for help. 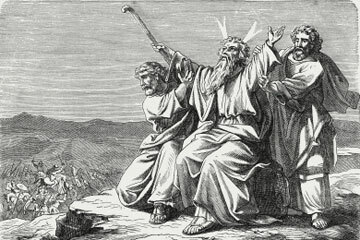 Aaron in the story represents the priesthood. Hur, the leader of a family, stands for our friends. We can go to our spiritual leaders and our friends for help and support. Talking to a trained counselor or mediator is another supportive and beneficial way of gaining perspective. All of these people can hold our hands up toward the Lord. They can help us reach upward to these spiritual principles and give us the support to get us through the battle. Together, we fight until the going down of the sun, and the battle is won in the name of the Lord.